The Harriet Theater stage was a blank canvas waiting to be painted. George Seurat, played by Matt Horohoe, turned away from Dot, played by Hannah Laird, to return to his painting. Dot followed him angrily as he climbed the ladder to work on his immense painting, The Sunday Afternoon on the Island of La Grande Jatte. She shouted at him, "Yes, George, run to your work. Hide behind your painting. I have come to tell you I am leaving because I thought you might care to know-foolish of me, because you care about nothing." (George) I care about many things. (George) People, too. I cannot divide my feelings up as neatly as you, and I am not hiding behind my canvas-I am living in it. (Dot) What you care for is yourself. "Tell me that you're hurt, Tell me you're relieved, Tell me that you're bored. Anything, but don't assume I know. Tell me what you feel!" My fatigued eyes watered up as I sketched the heated argument in song. I knew every word. Having seen the original, Sunday in the Park with George on Broadway, I was excited when Mad Cow Theater announced that this musical would be the first show to open in the new Harriet Theater (54 Church Street, Orlando). 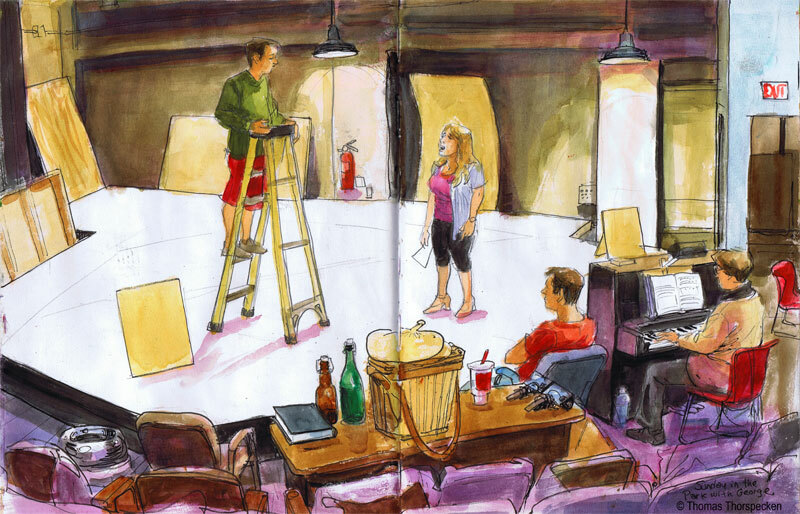 The space was still raw and unused when I walked in to sketch a rehearsal. All the theater seats were still covered with bubble wrap. Director Timothy Williams sat in the front row watching the actors perform. Everyone was still, "on book" but the performance as Seurat and Dot argued was vibrant and hit home. I was shocked at how much Hannah Laird, with her cherub-like face resembled Bernadette Peters. Robin Jensen on piano slowed down the beat in one scene so the actors could keep pace and then speed up.The actors did an amazing job keeping up with Sondheim's fast paced lyrics. Their voices were warm and full. Robin kept stressing that everyone needed to clearly enunciate each word. A square cut out stood in place for a dog. George interacted with the dog as he sketched, personifying how his life might be. No one knew if the dog would face stage left or right once cut out and painted, so Tim shouted out for someone to look at the painting to find out. It turns out that George had been addressing the dogs rump. I liked that Tim suggested to Matt that he think about the old Disney animators and the way they would act out how a deer or a dog might behave. When all the actors assembled on stage to recreate the finished painting my heart swelled with the music. It is easy to see why this show won a Pulitzer prize. As I left, Tim noticed I was carrying an artists stool and he pointed at me saying to the prop man, "Look! That is the kind of seat we need for George!" The ladder will later be "pimped out" with a shelf where George keeps his palette, paints and beer. The music and Lyrics are by Stephen Sondheim and the play is based on a book by James Lapine. The opening Night performance in Orlando will be October 6, 2012 and the show runs through October 28th. The gala, which will take place on October 6, features a pre-show dinner at the Rusty Spoon, followed by the Opening Night performance of Sunday in the Park with George, and a post show cast party at Kres Chophouse (17 West Church Street, Orlando). Gala tickets are $125. Regular show ticket prices are $25-$32. "A blank page or canvas, his favorite. So many possibilities."